The SOCRATES microsatellite securely transmitted data to a receiver on Earth using a process called Quantum Key Distribution, marking the first time the technique has used between the ground and space. For the first time, scientists have demonstrated laser communications between a microsatellite and a ground station while using the quantum nature of photons to secure the data being transmitted. The work, carried out by researchers at the National Institute of Information and Communications Technology (NICT) in Japan and recently published in the journal Nature Photonics, demonstrates an "unhackable" quantum communications technology known as Quantum Key Distribution, or QKD. "The main advantage [of QKD] is the unconditional security," team leader Alberto Carrasco-Casado told Space.com. "When quantum computers are developed, the security of conventional communications will be compromised, since current cryptography is based only on computational complexity. "The development of practical quantum computers is only a matter of time, which has made quantum communication a hot topic in the last few years, and the tendency is foreseen to increase in the future," he added. QKD is a very attractive method to totally secure communications. By recording data in the quantum states of individual photons, the process ensures that should the signal be intercepted, the quantum states will change — causing the recipient of the signal to be alerted of the breach. This is a basic tenet of quantum mechanics, based on Heisenberg's uncertainty principle; one cannot simply observe a quantum particle (in this case a photon) without irrevocably changing that particle's quantum state. With QKD, a secret key is shared between the transmitter and receiver. If a hacker tries to decode the signal as it travels from one to the other, the signal itself changes on a quantum level. So the system detects the hacking event, the secret key is discarded and the signal is broken, preventing the hack from continuing. To demonstrate this secured, high-capacity transmission of data between an Earth-based station and a satellite in low-Earth orbit (LEO), Carrasco-Casado's team used the quantum-communication transmitter, called SOTA (Small Optical TrAnsponder), on board the microsatellite SOCRATES (Space Optical Communications Research Advanced Technology Satellite) that was launched by the Japan Aerospace Exploration Agency (JAXA) in 2014. Weighing only 13 lbs. (6 kilograms), SOTA is the smallest quantum communications transmitter ever tested. Orbiting above Earth at 372 miles (600 kilometers), SOCRATES was traveling at over 15,000 mph (7 kilometers per second) when SOTA would establish contact with a 1-meter telescope located in Tokyo's Koganei city. The received signal was then guided to a quantum receiver to decode the information using a QKD protocol, the researchers wrote in their study. SOTA encoded the individual photons with 1 bit of data — either a "1" or a "0" — achieved by switching the photons between two polarized states — a method known as a "single-photon regime." SOTA then beamed pulses of laser at a rate of 10 million bits per second. On reaching the ground station, the laser signal was extremely weak (the researchers say that, on average, only 0.1 laser photons were received per pulse), but the quantum receiver was still able to detect the signal and decode the information over a low level of noise. 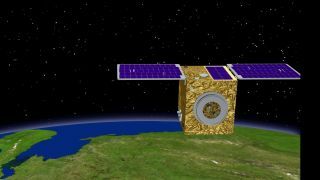 Now that the technology has been demonstrated using a microsatellite, Carrasco-Casado said he is thinking about future applications. "Maybe the most exciting application would be applying QKD to satellite constellations," he said. "Several constellations are now being considered with a huge number of satellites … SpaceX constellation plans to use over 4,000 satellites. If QKD can be miniaturized following the heritage of SOTA, this technology could be spread massively, enabling a truly-secure global communication network." The SOCRATES/SOTA mission ended in September 2016 after the satellite failed, Carrasco-Casado added, but the experiment had more than doubled the originally designed mission duration of over a year. "We are working on other future missions that will leverage the expertise and knowledge acquired with the SOCRATES/SOTA mission," he said. There is international interest in quantum communications, with research being carried out in Japan, China, Europe, Canada and the U.S.
A Chinese research team recently announced the successful quantum teleportation of individual photons from a ground station to the orbiting satellite Micius, which was launched by China last year. Like QKD, teleportation is a form of quantum communications. Teleportation involves the production of two quantum particles that form at the same time, in the same place — the two particles share the same quantum states, and measurements on one impact the other instantaneously. They are "entangled." In the Chinese experiment, pairs of entangled photons were produced on the ground, and some of the photons were transmitted to the ultra-sensitive receiver on Micius orbiting overhead. When the photons were received by the satellite, the researchers were able to confirm entanglement with those on the ground by "teleporting" the quantum state of a photon between the two, over hundreds of miles. "This work establishes the first ground-to-satellite up-link for faithful and ultra-long-distance quantum teleportation, an essential step toward global-scale quantum internet," the researchers wrote in their study, which was posted on the ArXiv preprint repository. As low-Earth orbit becomes more crowded, competition for the shrinking availability of radio frequency (RF) bands will eventually create a communications bottleneck, Carrasco-Casado's team said in a statement, so quantum communications solutions using laser technology will be needed not only to transmit data secured against hacking attempts, but also to send much larger quantities of data in a smaller space, as laser transmission allows. Follow Ian @astroengine and www.astroengine.com. Follow us @Spacedotcom, Facebook or Google+. Originally published on Space.com.